We care and respect your privacy at My Easy Directory. We are parents like you, and are committed to ensuring the protection of your personal information and to safeguarding your school community – your students, parents and teachers. As part of this commitment, we have prepared this Privacy Statement to be clear and honest about the use and treatment of your personal information. Don’t hesitate to reach out to us with any questions. Information provided to us by you or your organization will not be shared with any third parties without your express consent. The foregoing notwithstanding, we may be required to disclose your information in connection with law enforcement, fraud prevention, regulation, and other legal action or if My Easy Directory reasonably believes it is necessary to do so to protect My Easy Directory, its customers, or the public. For the sake of clarity, My Easy Directory will not sell, share, or otherwise make available any of your information to any third parties (including, but not limited to third party marketers or vendors) without first obtaining your express, written consent to such sharing. Your future use or participation in My Easy Directory shall NOT be construed as such consent. We may also acquire or divest some or all of our business assets, including information you have supplied. As part of any such transfers, we may share or convey your information to one or more third parties. When we contract with an organization (e.g., a parent-teacher association or organization) with which you are associated (“your organization”), your organization may provide us with your contact information and other personal information in its possession. For example, we may be provided with your name, address, e-mail address, telephone number, names of your children and spouse, as well as other similar personal information. Additionally, we may automatically collect other information about you, including your web browser type, Internet Protocol (IP) address, domain name of Internet service provider, geographic location, website pages visited and times of visit, and aggregated information that cannot be used to specifically identify you when you use or visit the website. If you wish to change or update the information associated with your account, you may do so by accessing your account using the user name and password established during your initial login. All user passwords will be stored in an encrypted format. Account administrators affiliated with your organization may also have the ability to access, change, or update your account information. Note that we may need to retain certain records for legal or internal business reasons and that some of your information may remain on backup systems, in compliance with applicable law. 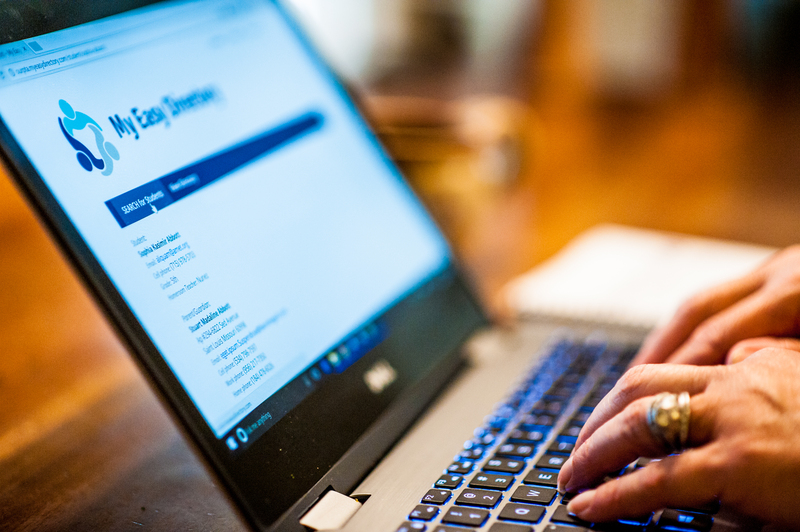 My Easy Directory will take reasonable precautions to protect your information from loss, misuse, or unauthorized alteration. Such precautions may include, but are not limited to periodic backing up of all information stored at our servers, checks to identify the presence of any software viruses, and review of our account security measures. Our vendors, contractors, employees, or partners who have access to your information in connection with providing services for us are required to keep the information confidential and are not permitted to use this information for any other purpose than to carry out the services they are performing for My Easy Directory. Your information will generally be stored in our databases, which are located in the United States. In limited circumstances, however, your information may be sent, usually on a temporary basis, to countries outside the United States. You may elect not to participate in the services provided by My Easy Directory to your organization. To delete your account and all of your personal information from the website, please contact your account administrator. If your account administrator does not delete your account and personal information promptly, please contact us at TheTeam@MyeasyDirectory.com and we will delete your account within seven (7) business days. A cookie is a small file stored on a user’s computer containing information about that user. Periodically, we may send you information about our various products and services, or other products and services we feel may be of interest to you. If you do not want to receive such information, please contact us at TheTeam@MyeasyDirectory.com. The elements of the website, including My Easy Directory’s graphics, logos, images, designs, sounds, information, text, and documents (the “Materials”), are protected by copyright, trademark, trade dress, trade secret, unfair competition, and other laws and are owned by My Easy Directory and its subsidiaries, divisions and affiliates; or its suppliers, vendors or other third parties who have contributed Materials to the website (each a “Supplier”). In no event shall any of the Materials be copied, reproduced, distributed, displayed, downloaded, stored in a retrieval system, or transmitted in any form without the prior express written permission of My Easy Directory and/or its Supplier(s). The My Easy Directory products and brands mentioned on the website are registered trademarks or trademarks of My Easy Directory in the United States and/or other countries. The names of actual products and companies mentioned on the website may be registered trademarks or trademarks of their respective owners. Any rights not expressly granted herein are reserved. Any of your personal information obtained by My Easy Directory from you or your organization belongs to you. Your personal information may include your name, address, e-mail address, telephone number, names of your children and spouse, or images uploaded by you or your organization that are associated with your account. THE MATERIALS ON THE WEBSITE COULD INCLUDE INACCURACIES OR TYPOGRAPHICAL ERRORS AND ARE SUBJECT TO CHANGE AT ANY TIME. THE MATERIALS ARE PROVIDED “AS IS” WITHOUT WARRANTY OF ANY KIND. TO THE MAXIMUM EXTENT PERMITTED BY APPLICABLE LAW, MY EASY DIRECTORY AND ITS SUPPLIERS HEREBY DISCLAIM ALL WARRANTIES, EITHER EXPRESSED OR IMPLIED, AND CONDITIONS WITH RESPECT TO THE MATERIALS, THEIR QUALITY, PERFORMANCE, SUITABILITY, MERCHANTABILITY, FITNESS FOR A PARTICULAR PURPOSE, TITLE AND NON-INFRINGEMENT. As a convenience to you, this website may contain links to websites controlled by parties other than My Easy Directory. We are not responsible for, and do not endorse, the privacy practices or content of these third party websites. We recommend that you carefully read the privacy policies of each site you visit. IN NO EVENT WILL MY EASY DIRECTORY AND ITS SUPPLIERS BE LIABLE FOR INDIRECT, SPECIAL, INCIDENTAL, OR CONSEQUENTIAL DAMAGES, WHETHER IN AN ACTION OF CONTRACT OR TORT, ARISING OUT OF THE USE OR INABILITY TO USE THE MATERIALS AVAILABLE ON THE WEBSITE, EVEN IF ADVISED OF THE POSSIBILITY OF SUCH DAMAGES. IN PARTICULAR, AND WITHOUT LIMITATION, MY EASY DIRECTORY SHALL HAVE NO LIABILITY FOR ANY LOSS OF USE, DATA, INCLUDING THE COSTS OF RECOVERING SUCH DATA, OR PROFITS. © 2019 My Easy Directory, LLC. All Rights Reserved.